In spite of the recent slowdown in retail sales, the continuing slump in the housing market and crude oil prices approaching all-time highs, stock prices both here and abroad continue to rise. Both the Dow Jones Industrial Average and the S&P 500 Index are now trading at their highest level ever, while the Nasdaq Composite Index is trading at its highest level in more than six years. Equity prices in Asia and Europe are also trading at, or near, all-time highs. Meanwhile, my research suggests that only risk-oriented, aggressive investors remain active in the equity markets, as many conservative and bearish investors have already exited the market. As a result, I am of the opinion that stock prices will continue to advance over the near-term. With China's and India's economies continuing to expand at a torrid pace, and economic growth in numerous other regions of the world also growing rapidly, corporate profits at large industrial companies and providers of basic materials are also rising. As a result, the stocks of these companies are adding to the gains in the major stock market indices. However, as the chart below indicates, the advances in the market indices may be distorting an important underlying fact - fewer and fewer companies (and their stock prices) are participating in the gains. 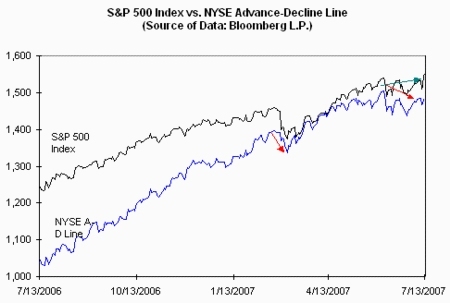 Historically, whenever there has been a significant divergence between the advance-decline line and the major stock market indices, stocks prices have fallen sharply in the ensuing months. Although I am not yet ready to throw in the towel, and think stock prices will continue to advance over the near-term, I am closely monitoring the readings on my investment models in an effort to alert you when I think the bull market may come to an abrupt end.